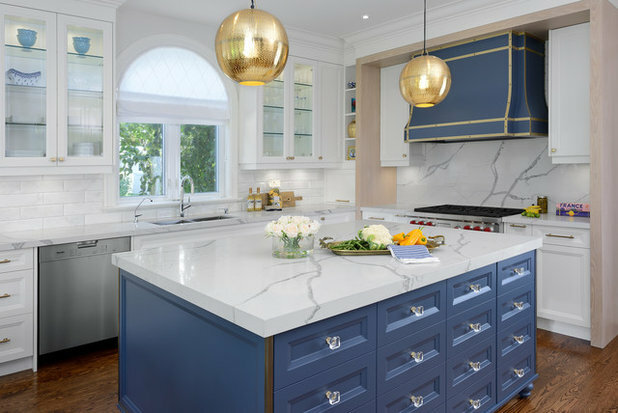 The windows and refinished oak flooring were existing, but aside from those elements, the kitchen features all-new materials that mix classic style, a bold accent color and touches of warm brass throughout. 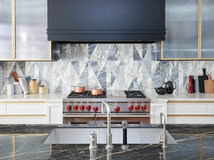 The former kitchen island was topped with an electric cooktop and downdraft vent that took up most of the usable counter space. 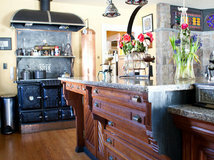 Ovadia put the new gas range on a side wall and designed a new island with plenty of prep space. 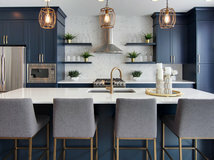 The designer says that since the previous island did not have space for counter stools, the family had become accustomed to sitting at the breakfast table, and didn’t want the new island to accommodate counter stools either. 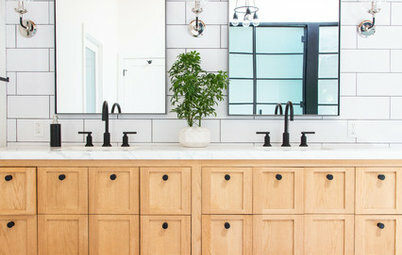 Therefore, Ovadia custom-designed an island with an apothecary cabinet-inspired back side. 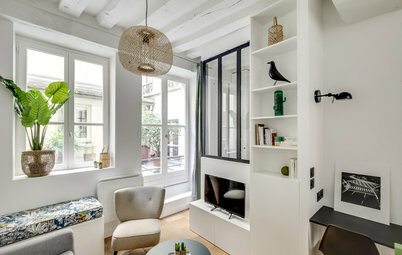 What looks like small drawers with glass hardware are false fronts concealing four doors that open for storage. 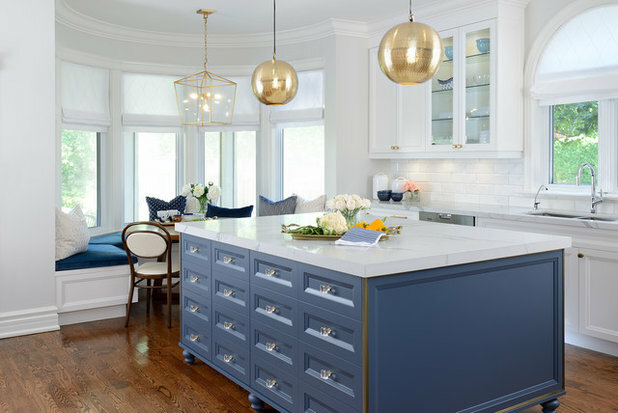 The island base is a custom shade of blue made of Benjamin Moore paints. 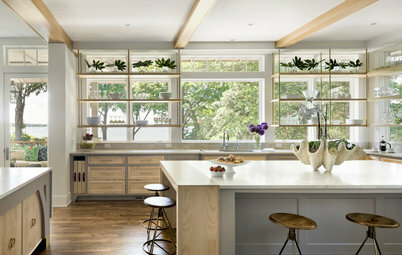 The former kitchen included a breakfast table in front of the bay windows that seated only four people. 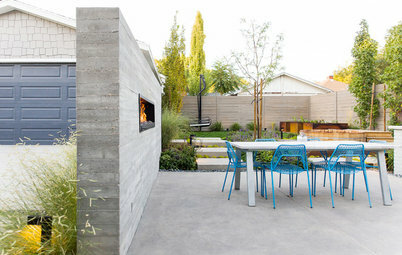 While this configuration worked for the homeowners and their two kids, it did not allow for extra guests. 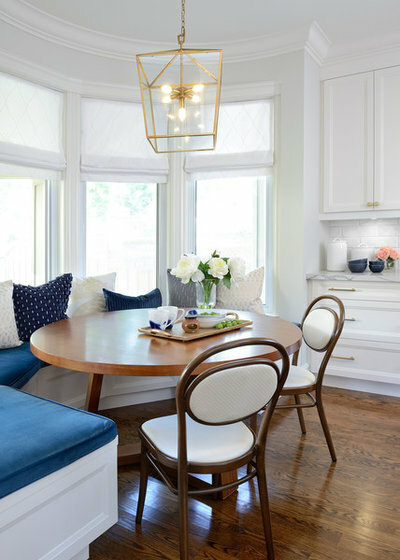 To create more seating and storage, Ovadia designed a banquette that wraps around the bottom of the bay windows. 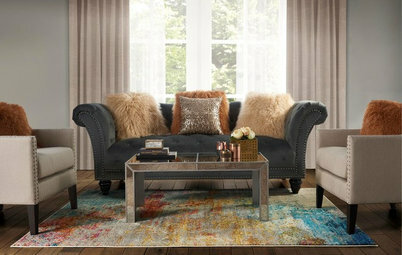 The banquette cushions are covered in a blue commercial-grade velvet, and the banquette base opens for storage. 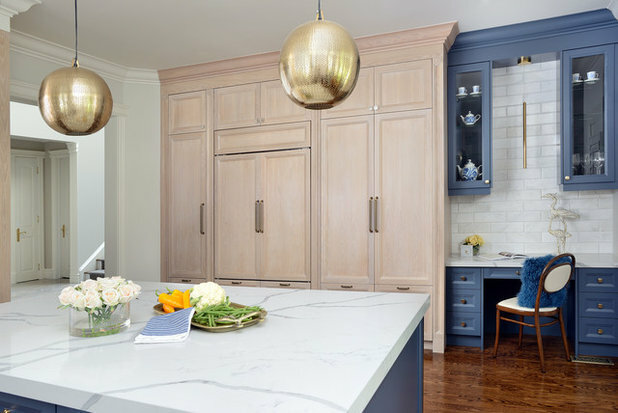 Ovadia custom-designed a pantry with an integrated refrigerator made of bleached white oak. To the right of the pantry, a built-in desk provides a great spot for paying bills and writing grocery lists. 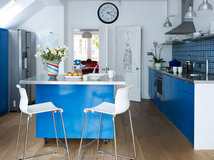 The desk and glass-front cabinets above it are painted the same custom blue as on the island. 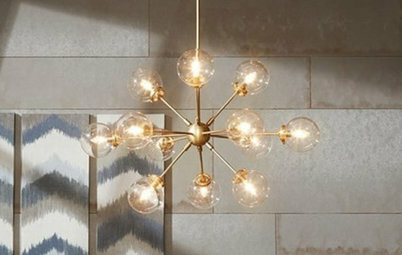 A single pendant light above the desk adds another touch of warm brass. 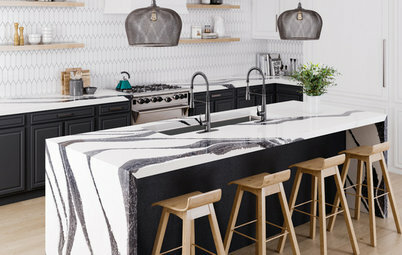 Ovadia designed the range wall to incorporate all of the materials and colors found throughout the kitchen. 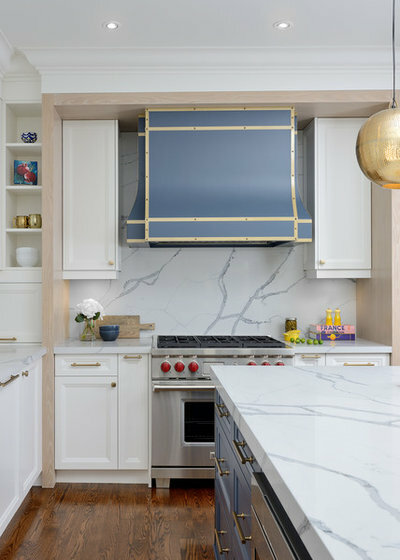 The backsplash is covered in a slab of marble-like quartz, the range hood is painted a custom blue and outlined with riveted brass, and a border of bleached white oak delineates the space. 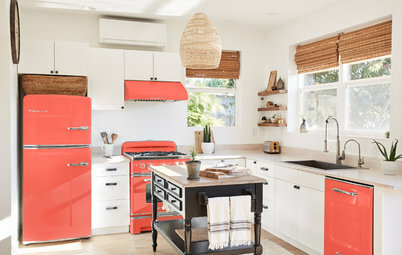 “The range wall is a feature wall that ties everything in the kitchen together,” the designer says. The island doesn’t need seating. There is seating to the left of the island. 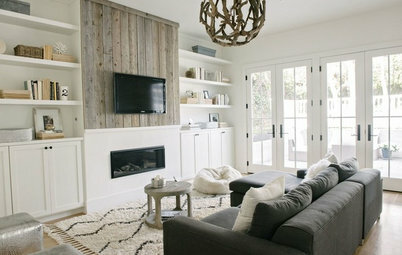 Love the colors used here—all white with just the right amount of contrasting color. This is lovely. Who is the vendor for the brass lights over the island. 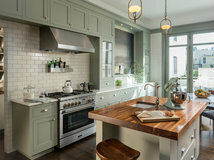 I have a two-tone kitchen great room with natural and cordovan mixed-height cabinets and only wish to change the lights. 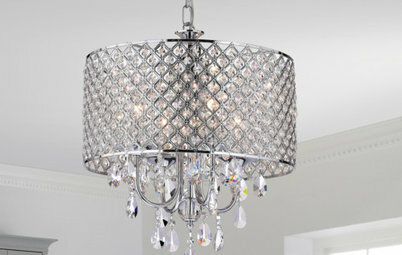 (lights now are black iron} Thank you.